With his grandfather in tow, he goes to many Jewish stores, but no one has that perfect menorah. All of the ones in the stores are either too flashy or too expensive. One fits in his palm and holds birthday candles. Another has mosaic tiles and is shaped like the Western Wall in Jerusalem. Just when Nathan is about to go home, his grandfather comes to the rescue and tells Nathan about the timeless tradition of bargaining. At first, Nathan doesn’t see how this might help, but then walking home, he spots a tarnished menorah in the basement window of a junk shop. Before long, he has struck a deal with the shopkeeper and finally owns his perfect menorah. Jacqueline Dembar Greene is the author of more than thirty books for young readers. She has written novels, picture books, nonfiction, poems, and short stories, and two of her historical novels were named Sydney Taylor Honor Books. She lives in Wayland, Massachusetts. Judith Hierstein earned a bachelor’s of arts degree in art education from the University of Iowa. A former elementary-school teacher, she is the illustrator of Jim Limber Davis: A Black Orphan in the Confederate White House, The Pilgrims’ Thanksgiving from A to Z, and the Toby Belfer Series, all published by Pelican. She lives in Tucson, Arizona. Click here for sample pages. Click here for Chapter 1. Click here for the Front Matter. 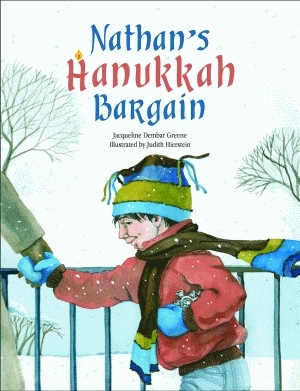 Click here for Nathan's Hanukkah Bargain activity guide.